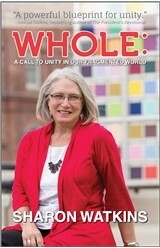 Beginning in September, our Elders will be studying Whole: A Call to Unity in Our Fragmented World by the Rev. Dr. Sharon Watkins. In her hope-filled new book, Sharon Watkins, the General Minister and President of the Christian Church (Disciples of Christ) and moderator-elect of the National Council of Churches, shares her vision of how the good news of Jesus calls American Christians to unite around justice, mercy, and openness in the 21st century. She explores the question of how do we take the liberating gospel of Jesus to the world today? Then explains that what really matters “is the relationship with a living, loving God, a God who calls us to love each other, to create communities of care and equipping for wholeness, so that the love and hope we know through our relationship with Christ can truly be carried from our doorsteps to the ends of the earth.” The book can be purchased at www.chalicepress.com.